I’ve shared before how I hate waste, and always try to find recipes that will use up ingredients before they go off, so finding a good Banana Cake Recipe has been an ongoing trial for a while. We often have a couple of bananas past their best and I always try to get them used up somehow. Previous attempts at Banana Cake usually result in quite a rubbery texture and thick, chewy ‘crust’. But not this one. 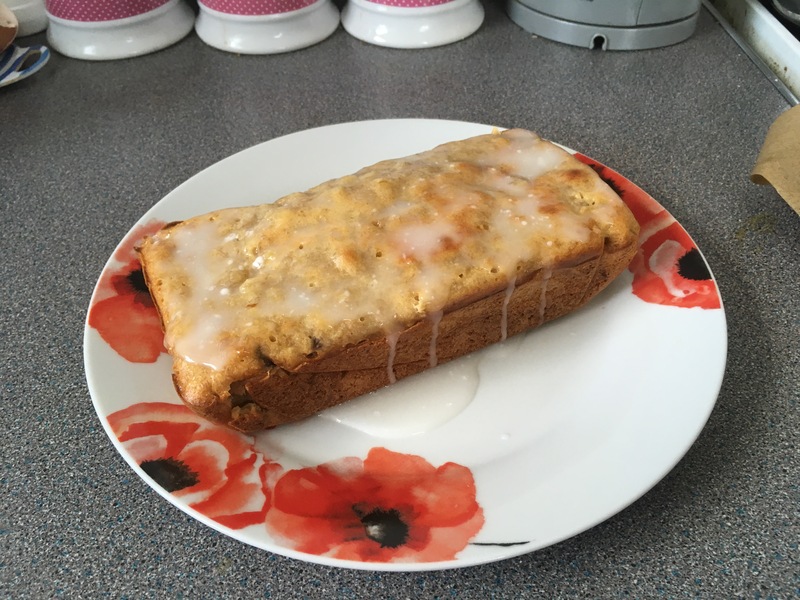 This is by far my favourite Banana Cake Recipe and now my go-to recipe. Really simple to make. It’s lovely and moist, not rubbery at all, and has a lovely cakey outer layer, no thick, chewy crust. But don’t just take my word for it, give this recipe a try and see for yourself. Plus a loaf tin, baking paper & kitchen foil. Pre-heat oven to 150 degrees C (fan oven), 170 degrees C (standard oven) or gas mark 3. Grease and line your loaf tin. Melt butter and sugar together (either in a pan on the hob or in the microwave), until the sugar is dissolved. Sift flour into a bowl and add a pinch of salt. Add the melted butter and sugar mixture. In a separate bowl, peel and mash the bananas, then add to the flour/butter mixture. Crack and beat the eggs, then add to the mixture. Combine everything well either by hand or using a food mixer. Scrape mixture into your loaf tin. Over the tin loosely with kitchen foil. Bake in the oven for 45 minutes. If you want the top of your cake to brown, remove the kitchen foil for the last 10 minutes of baking. After 45 minutes, insert a knife to make sure it comes out clean , if not, put back in the oven and keep checking every 5 minutes until the knife comes out clear. Once baked, leave in tin to cool slightly for 15 minutes. Once slightly cooled, transfer from tin to a plate. Make up a small amount of icing to drizzle over the top.